Ho Etsu Taiko began as an offshoot of MBT’s Dharma School Taiko class in 1997. 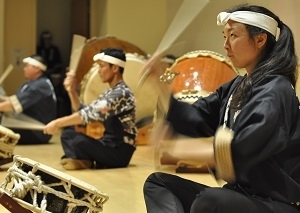 Since then, Ho Etsu members have matured both in age and their approach to taiko. Today, while Ho Etsu has grown into a dynamic taiko ensemble with an independent 501(c)(3) not-for-profit status, its connections to our temple remain strong. Their philosophy is simple: Spread joy and vitality through each and every drumbeat. You can learn more about Ho Etsu Taiko by visiting their website www.hoetsu.org.